A set of common classes for dealing with collections of other objects. Problems An interface for a collection of Problem objects, with multiple overloaded methods for adding errors, warnings, and informational messages. AbstractProblems A list of problems for some execution context. Collections A set of utilities for more easily creating various kinds of collections. EmptyIterator<T> A reusuable Iterator implementation that has no elements. ImmutableAppendedList<T> An immutable List that consists of a single element appended to another existing List. 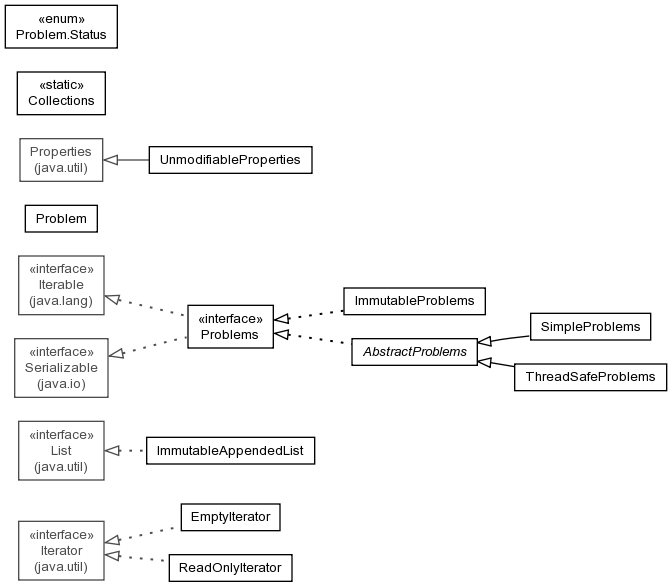 ImmutableProblems An immutable wrapper for a mutable Problems. Problem An immutable representation of a problem, with a status, code, internationalized and parameterized message, values for the parameters, information about the resource and location, and an optional exception. ReadOnlyIterator<T> An Iterator implementation that only allows reading elements, used as a wrapper around another iterator to make the contents immutable to the user of this iterator. SimpleProblems A simple Problems collection. ThreadSafeProblems A thread-safe Problems collection. UnmodifiableProperties An immutable Properties implementation. A set of common classes for dealing with collections of other objects. Some of these classes work with standard collections, while others represent Problems that record multiple warnings, errors, and informational messages.